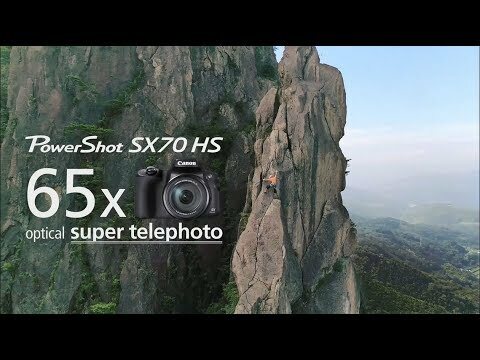 With its incredible 65x Optical Zoom, image stabilization of up to 5 stops and 4K video recording, the PowerShot SX70 HS camera has you covered. From fun-filled family moments to once-in-a-lifetime travels and adventures, capture everything including faraway sights, ultra-wide vistas and spectacular, frame-filling, close-up macro shots like never before with a PowerShot SX-series camera. A bright and detailed electronic viewfinder combined with intuitive controls enable you to capture incredible moments as the opportunity presents itself. ziggy note; There is no Flash Hot Shoe on the SX70, like there was on the SX60. Low-speed Continuous Shooting in One-Shot AF mode: Approx. 3.0 shots/sec. High-speed Continuous Shooting in Servo AF mode: Approx. 5.7 shots/sec. Low-speed Continuous Shooting in Servo AF mode: Approx. 3.0 shots/sec. Electronic color viewfinder On: Approx. 75 min. If I'm reading the specs correctly, it doesn't support a raw format. That would be a show-stopper for me. I agree that would be a serious omission for the SX70. Hopefully it's just an oversight in the US documentation, because both PetaPixel and Cameralabs mention RAW/CR3 files, and both Canon Europe and Canon UK mention RAW/CR3 files. Specifically, Canon Europe says, "In addition to sharp JPEGs, the Canon PowerShot SX70 HS can capture images in RAW or compact RAW format, opening a world of professional post-production techniques, providing limitless ways to impress with optimised photographs." Yeah, probably an oversight. It wouldn't make sense otherwise.